Guys, I’m just pudding it out there that this chocolate cinnamon chia seed pudding is the bomb. Dot com. Yeah, yeah, chia seed pudding had its big moment cool, like, two years ago. But I maintain it’s a healthy and yummy staple that everyone should make every month! It’s all about the proper liquid to chia ratio. Also, using a creamy milk, such as whole milk, or a heavy bodied flax milk or almond milk if you want dairy-free. We buy our whole milk from Costco since it’s the best price for the best quality. This recipe was actually inspired by the sample gal at Costco. She was handing out samples for chia seeds in cranberry juice, and we struck up a conversation about the awesomeness of chia. Five minutes later, I left with an arsenal of chia knowledge, a chocolate pudding recipe, and a couple extra samples. They are a good source of omega-3 fatty acids which equals healthy brain and reduced risk for heart disease and cancer. Sign me up. One word: FIBER. Want to stay regular? 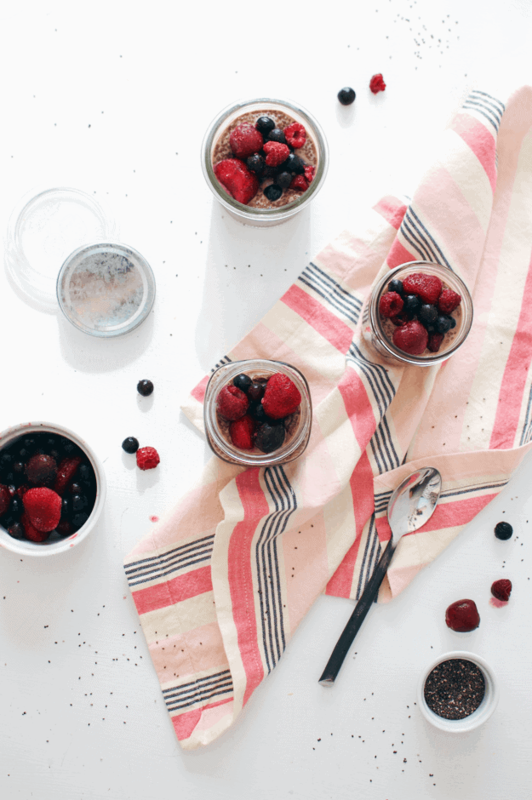 Take a serving of chia seeds every day, whether it’s in this pudding for breakfast, or mixed in your morning green smoothie. You will feel like a new person! Chia seeds are an excellent plant-based source of protein with 4 grams of protein in each 1 ounce serving. 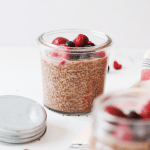 As I mentioned, I made this chocolate cinnamon chia seed pudding with whole milk for extra protein, but it’s just as delicious with any plant-based milk if you are looking for a dairy-free treat. It is also refined sugar-free! Yippee! 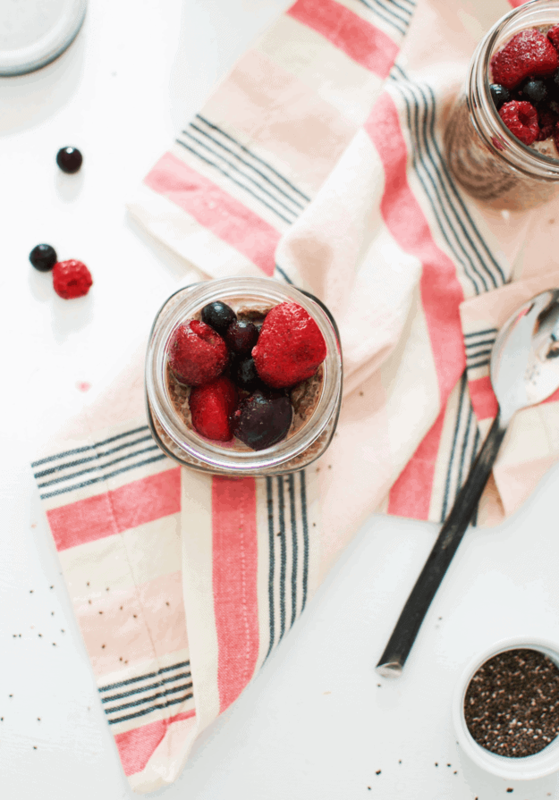 Now, go make this chocolate cinnamon chia seed pudding! Your hungry stomach will thank you every morning. The recipe is below. Enjoy! 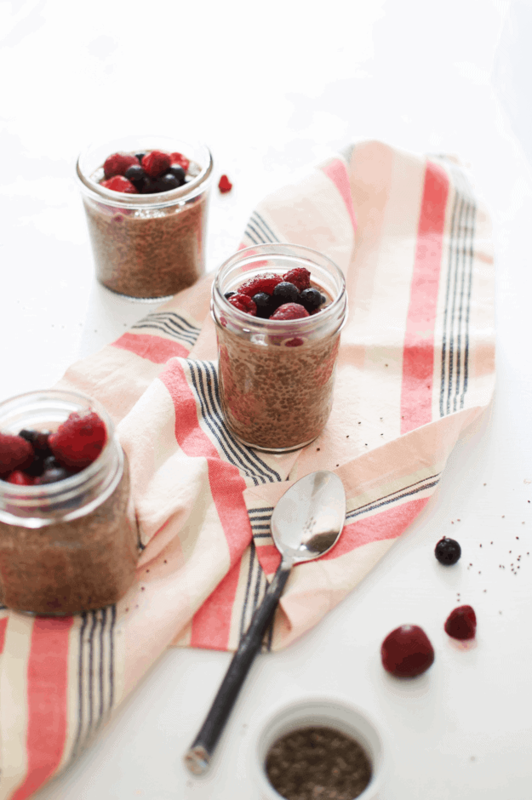 Make this chocolate cinnamon chia seed pudding for a healthy morning breakfast or treat. 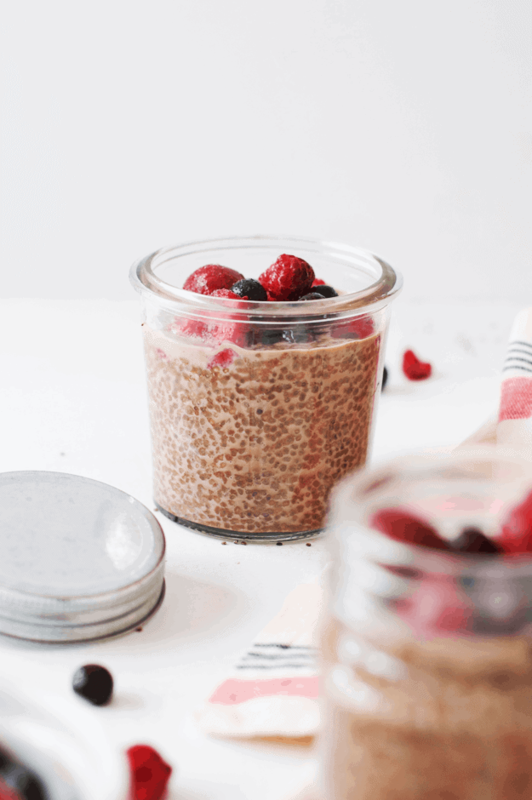 The health benefits of chia seeds will help you feel your best, and you can also use this as an egg substitute for vegan baking! In a mixing bowl, whisk together milk and maple syrup. Add in the cocoa powder and cinnamon, and whisk until smooth and foamy. Add in the vanilla and chia seeds last and give it a good stir. Seal the bowl and refrigerate for at least 5 hours, or overnight. Make sure to stir it once in the middle of setting up to mix any chia seeds and that fall to the bottom. Once it is ready, stir again to mix together flavors and serve cold. Add fresh berries or whipped cream for an additional tasty topping. Enjoy! Hello, I’m Abbey! Welcome to The Butter Half, where I share nourishing & easy gluten-free recipes and wellness tips for the family. Four months after being diagnosed with celiac disease and a thyroid autoimmune disease, I healed my body using holistic nutrition and herbs. And I believe you can, too. My goal for The Butter Half is to provide you resources, knowledge, and tips to achieve your ultimate wellness goals, using plants and whole foods. You deserve to live your best life, and I am here to help you do just that! Nourishing recipes & wellness made easy. Join thousands of others in The Butter Half community and sign up below for a free daily self-care toolkit, weekly family recipes, and more!